The Battle for Pennsylvania continues on tonight as the Pens take on the Flyers for the fourth time this year. The game will be shown on FSN-Pittsburgh and NHLTV-US. As such, no screenshots from our recap tonight. The Flyers have played well as of late with a 5-1-1 record in their last seven behind backup-backup goalie Michael Leighton. With a record of 20-19-3 Philly has certainly not lived up to their expectations. With the addition of Pronger and Emery many chose them to win the division, even to be Stanley Cup contenders. Though there is still time left in the season for them to turn things around. The Pens are coming off their first win in 5 games over the Thrashers. Nothing to get overly excited about since they're just 2-5-0 in their last seven. The upside? Gonchar is expected to return after taking a puck to the skate a few games back. Likewise its always easier to play the game after a win after a slump, you always want to get that one win under your belt. And the fact that the Flyers are in town makes it that much easier to get excited about. The Penguins have won all three previous meetings this season. Two including a back to back effort that snapped a 17 year record of either team winning both games in a back to back. 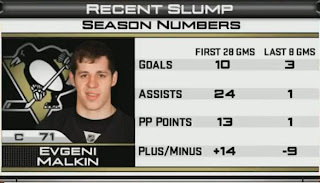 Not sure what we're going to see from a slumping Geno tonight. He did state in the past he doesn't like playing against Philly, he thinks they're dirty...he's right. Hoping he can keep the magic from the Caputi goal alive. Keys to Winning: Puck Management, Defensive Position, In Zone Pressure. Geno needs to shake off blues and get back to the basics. Every play doesn't have to be a highlight. Don't get caught up in the moment. The game will be filled with emotion, just play hard and smart. Long time Pens Universe readers will remember this pic from last year's playoffs.